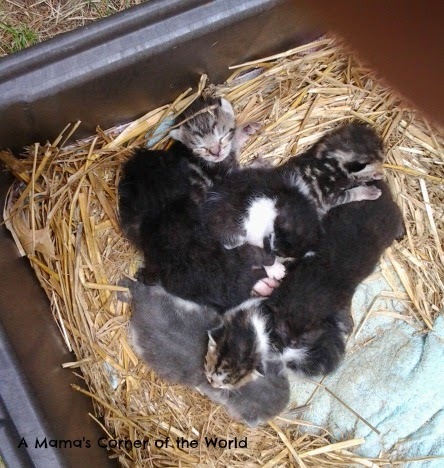 The girls were so excited to learn that one of the semi-tamed cats at their grandparents' house had delivered an unexpected litter of kittens just days before Mother's Day. Neither girl had ever seen fairly newborn kittens--and neither has really stopped talking about them since seeing them. 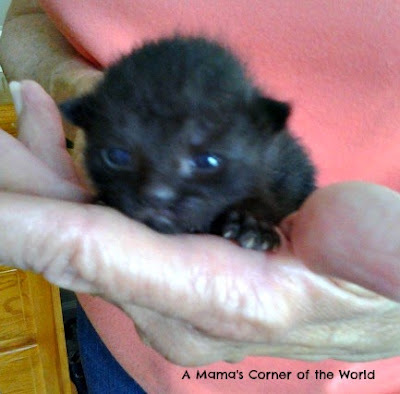 We thought we would share a few pictures of the kittens as this week's Wordless Wednesday link up! The girls couldn't choose a favorite--but, if I had to pick one--the tiny grey and white one (the tiniest of the litter) would probably be my first choice.....or the black and white one....or one of the striped ones....Okay. I guess I couldn't really choose a favorite either! I think I could love that face! The little one at the top, showing us his face, reminds me a lot of our Frito when he was a tiny bundle of fluff! I think this little guy (or gal) was one of the first to open his eyes. The girls think he looks a bit grumpy with his pouty "frown" and bad hair day! He's still pretty cute--even if he does look just a little like a grumpy bat! What's happening in your little corner of the world? A huge awwww what a cute bundle of kittens heheh! Too cute! Even the grumpy looking one. How super duper adorable! Are they going to keep all of the kittens? Precious! I would take one but we have 7 dogs! Awww adorable! They all look cute! Oh my goodness, these tiny baby kitties are so precious! I wish I could pick one up and hold him or her right now! Oh my goodness!!! So absolutely ADORABLE!!! I love them all! Such sweet little babies. They're very sweet and cuddly! 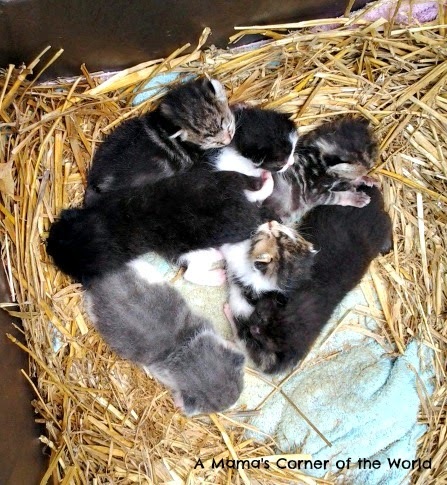 A bundle of furry cuteness...Thanks for adding such beauty to Oh My Heartsie Girl Wordless Wednesday! I cant think of anything cuter than itty bitty kitties!!! Thanks for stopping by The Oh My Heartsie Girls WW this week to share!!! They sure do look sweet. oooh..they are sooo cute indeed...ans so many of them! I won't be able to pick my favorite either..each one of them is so lovely. Ahhh, itty bitty kitties. Those are adorable. I like the grey and white one best too.